You will be seeing a lot of news coverage coming out of this week's cardiology conference about a large study of the statin drug, Crestor, which supposedly found it cut cardiovascular deaths in a group of people with normal LDL better than a placebo. What most news coverage is leaving out is this: The group of people with "normal" cholesterol who took Crestor in this study weren't just any old group of people. They were people with elevated CRP. This is an important distinction. CRP stands for C-reactive protein and it is a measure of inflammation. Earlier studies had shown that statins are only helpful in reducing cardiovascular events in people with pre-existing heart disease. Accumulating evidence suggests that they do this by reducing the artery inflammation that is characteristic of heart disease, not by reducing cholesterol. There has never been any truly solid proof that high cholesterol in and of itself causes heart attacks. So this latest Crestor study may actually have done to finally narrow down who it is who should be taking statin drugs to the subgroup of people, whatever their cholesterol might be, whose CRP is elevated. Given the way this new story is being reported, I'm not sure we can count on the drug company to give doctors thats message. Instead, the message might be that everyone, no matter what their cholesterol might be, should take this expensive drug. This might be a mistake. Statins cause serious and sometimes irreversible side effects, some of them affecting mental function. They are particularly dangerous in older people. If your doctor wants you to take a statin, demand that you first have a CRP test. If your CRP is normal and you have not been diagnosed with heart disease using a definitive diagnosis from something like an artery scan, rather than an inference from something like a high cholesterol test value, you may not need the statin. I've done this myself, and my CRP was rock solid normal. That is one reason I have been very resistant to the idea of taking statins no matter how high my LDL might be. I saw a statin cause almost instant deterioration in my dad's hitherto stellar mental functioning, and no way am I gambling with mine! Another piece of Crestor news is that a smaller study, which reanalyzed results of the Asteroid trial, found evidence of some regression in artery plaque in people taking Crestor. This particular trial did not investigate whether the changes observed actually mapped down to fewer heart attacks. Also, keep in mind that these are reports at a convention, not peer reviewed research studies, and we won't really know how significant the findings were until we see the actual data in a publication. We also won't learn about the side effect profile of Crestor that was observed in these trials. So, as is usually the case, the devil may well be in the details. For now, it's worth noting that most of the coverage of these reports is in the business press because the bottom line is that $tatin$ are all about profit$. There was a story in the news today about a study to be published in the journal, Science which for the first time convincingly demonstrates that there are genetic factors associated with schizophrenia. This story had particular resonance for me because my father was an influential Freudian psychologist whose career peaked in the 1950s. Many of his older psychiatrist friends had been students of Freud. So while I was growing up, I sat in on many a dinner table conversation between my father and his peers about schizophrenia and its causes. My father's psychiatrist friends were powerful people in the psychiatric establishment in New York City. Often they'd brag about their celebrity clients. And they had no doubt at all about what caused schizophrenia: bad mothering. The theories varied in details. Did a child become schizophrenic because they had what Bettelheim called a "refrigerator mother," or should the blame fall on the inconsistent mother who gave the child mixed messages? Others blamed the mother whose feminine sexual expression was too strong, but then, equal damage might have been done by the mother who confused her son about his gender identity by not being feminine enough. All these theories had in common only this--that these influential doctors wrote and taught that the ultimate cause of schizophrenia was something the patient's mother had done wrong. And that these experts were utterly and irredeemably wrong. But such was the power of these men within their profession that for decades they added an inconceivably cruel burden to the lives of the mothers whose lives were already hard enough, by telling them that their children's terrible untreatable mental condition was all their fault. So you can imagine how I felt when I read that after years of futile searching for genetic causes of schizophrenia, scientists had been able to use new, sophisticated techniques of examining the genome to begin to identify some of the many different genetic flaws that interfere with the complex pathways involved in how the brain processes thought. And that of course made me think of how another generation of powerful experts continue to increase the load of misery on another population whose condition is most certainly genetic in nature too: people with Type 2 diabetes. Like schizophrenia, Type 2 diabetes is not one disorder, and it is not caused by one gene. Dozens of genes have been linked to the development of Type 2 diabetes--genes that affect insulin secretion, the function of mitochondria, and many other subtle factors. Only slowly is it starting to become clear that genetic flaws--inherited or induced by environmental toxins--disrupt glucose metabolism at any of a multitude of locations in the complex pathways involved and that without such a genetic flaw, no matter how fat or sedentary a person might be, they don't develop diabetes. Don't expect the experts to change their tune on this, though. You'll still read diabetes "experts" pontificating that diabetes is "caused by obesity" and could be cured if people lost a couple pounds eating a low fat diet and got off their lazy butts and exercised. In the case of psychiatry, my dad's friends never gave up their misguided theories. My dad died still convinced that Freud's toxic theories could explain anything that happened in the personality. But no one lives forever, and now he and his peers are all gone, replaced by a newer generation of psychiatrists who ditched Freud's toxic woman-hating theories in favor of drug treatments that, whatever their failings, could at least improve the lives of their patients. We will probably have to wait for the current crop of experts to retire to see the same kind of change in public understanding of diabetes. One cannot help but hope that the diabetes experts continue to eat the low fat diets they are so enthusiastic about and maintain for themselves the A1cs they push on the public, to hasten the process. But in fifty years the public will look with the same kind of horror on the doctors who blamed children and adults for causing their own Type 2 as they do on those toxic mother-hating theories. I just hope I can hang on long enough to see it happen! Two related findings have come out recently that point to the role of insulin and insulin-like growth factor (IGF) in longevity. One was the finding from the Albert Einstein School of Medicine's Longevity Study that longevity was associated, at least in females, with the presence of a gene that decreased the secretion of IGF. They discovered this after noting that female offspring of female centenarians tended to be about an inch shorter than normal. Functionally significant insulin-like growth factor I receptor mutations in centenarians. Yousin Suh et al. The other was the finding in the worm, c. elegans, that, as Science Daily reports, "insulin inhibits a master gene regulator protein known as SKN-1, and that increased SKN-1 activity increases lifespan. SKN-1 controls what is called the Phase 2 detoxification pathway, a network of genes that defends cells and tissue against oxidative stress -- damage caused by elevated levels of free radicals (byproducts of metabolism) -- and various environmental toxins." I was a subject in the centenarian study since my dad was a centenarian, but because they only looked at the genes of the children of female centenarians I don't have any data about whether I carry this gene. Still, this is the first time I've ever heard anything suggesting that all those years of being called "shrimp" on the playground and of always being the shortest kid in my class might pay off, big time. Scientists have long known that you can extend the lifespan of most organisms by cutting way back on their food. But perhaps these findings mean the eat-less longevity approach it isn't about cutting down on food so much as it is about cutting back on foods that stimulate insulin secretion. Those foods are, of course, carbohydrates and to a much lesser extent proteins. So once again, we get a very good reason to embrace eating fat and back off those "healthy grains and fruit" nutritionists insist are "good for us." But what about those of us, self-included, who inject insulin or take drugs that increase insulin production? Well, it's a matter of trade offs. We know that high blood sugars damage our bodies, so whatever longevity benefits there might be in cutting back on insulin are going to be balanced by the life-shortening effects of clogging our capillaries and killing our nerves when our blood has become glucose-laden sludge. We should also be very careful about taking drugs that increase our insulin resistance, most notably the SSRI antidepressants. These drugst raise insulin resistance and hence raise insulin levels in people who take them, no matter what their blood sugar level might be. 1. Keeping blood sugars at normal levels. When your blood sugar goes up to 200 mg/dl you get a lot more insulin resistant no matter what your fundamental level of insulin resistance might be. 2. Exercise--for many people. (Not all, but that's another blog post!) But be careful about what kind of exercise you pursue. If you work up a huge appetite when you exercise and end up eating more than you otherwise would have, you'll undo any benefit of that exercise because more food will mean more insulin. This may be one reason that brisk walking or modest amounts of biking, which aren't likely to cause dramatic blood sugar swings and the resulting hunger might be more healthy, long term, than more heroic exercise routines. 3. Weight loss in people who are seriously overweight. And if you are insulin resistant, the research suggests that you are much more likely to lose weight on a low carb diet, though the same research suggests that people who are NOT insulin resistant can lose equally well on any diet that reduces calories. 5. Avandia and Actos, though they appear to cause so many undesirable side effects long term, including osteoporosis, that they are probably not going to increase your longevity. If you are doing all you can and are, like many people with diabetes still insulin resistant and still dependent on large amounts of insulin to control your blood sugar, should this data ruin your day? No. One other thing that the Albert Einstein Med School longevity research has proven is that longevity is mostly a matter of getting lucky genes. In a CNN interview, Dr Barzilai, the chief researcher on the longevity project said in regards to the population of centenarians he's following, "We don't have yoga teachers. We don't have vegetarians. Thirty percent of them were overweight or obese in the 1950s. We don't have anybody that's exercising. There are several people who smoked. So for those people, the environment didn't matter. They had something else that we think is genetic." So taking heroic efforts to extend your own life is usually futile. Don't forget the fate of Dr. Roy Walford, the most famous proponent of the Life Extension diet, dead at 79 of ALS. Or my mom, whose fasting blood sugar at age 92 is 81 but who got dementia from cancer chemotherapy a decade ago. It isn't all about blood sugar. . . The tide is turning folks! It has taken decades, but very slowly the message is starting to get through that diabetes is NOT caused by obesity and that the best way to determine if you are heading towards diabetes is to test your blood sugar with a meter. Tired? Don't Assume It's Your Lifestyle. The writers quote a doctor as saying re diabetes, ""Even someone who looks perfectly well, not overweight at all, can be affected." Then they take a blood sugar meter and test a bunch of people. They present the people's photos, data about their age, weight, and lifestyle and what their blood sugar turned out to be. If it wasn't normal they sent them to a doctor. The cutoff they used for normal was 160 mg/dl after eating and 106 mg/dl fasting. Lots of overweight people they tested came out completely normal. In fact the second lowest reading, 82 mg/dl was that of an obese woman. The only reading lower was 55 mg/dl which looks like reactive hypogycemia. The woman with that reading had a family history of diabetes. A few young people of normal weight they tested turned out to have abnormal blood sugars. One, only slightly overweight, was told by a doctor she had prediabetes and the other who was completely normal weight-wise but tested at 165 mg/dl and then 130 an hour later and was told she needs more follow up. Those readings suggest very early deterioration. But isn't this exciting! Just imagine if people started bringing meters to work and having parties to see what everyone's random blood sugar was and sending everyone with abnormal readings to get checked out. Of course, this happened in the UK where doctors do the oral glucose tolerance test to check for diabetes, NOT the fasting blood sugar test used in the U.S. which is almost worthless at identifying anything but fully-progressed diabetes of several years duration. Still, what a concept. How different my life might have been if someone had taken my abnormal glucose tolerance results seriously when I was a very thin 28 year old! Coincidentally, yesterday's AP newswire ran a story about MODY and other forms of genetic diabetes. My top fave diabetes researcher, Dr. Hattersley was quoted. He's the doctor who was so helpful to me when I was trying to figure out what was going on with my own diabetes. Most interestingly, the article had this to say about genes so far identified as being involved with Type 2 diabetes: "Surprisingly, the Type 2 genes don't affect how the body uses insulin, thought to be the trigger. Instead, they alter how the pancreas makes insulin in the first place, explains Dr. David Altshuler of Harvard and the Massachusetts Institute of Technology." In short, these Type 2 genes don't cause IR, they cause secretory defects which the article goes on to suggest become critical when environmental factors like weight gain stress the glucose control system. What the article doesn't say, but what research has shown is that weight gain often RESULTS from the marginal blood sugar control caused by the original secretory defect. But oh my stars! What a nice change from all that media bleating about how "diabetes is caused by lazy people eating too much." All that remains to make me a very happy lady is for another mass media organ to highlight the fact that cutting way down on carbs is far more effective at normalizing diabetic blood sugar than either oral drugs or WLS. But to see that I'll probably have to live to be very, very old. I finally figured out how to turn the information on my Bloodsugar101.com web site into a book that would provide real value for readers. I'm polishing up the text now and the book should be coming out in April. You can see the cover mock up above. The reason I felt it was time for a book was two-fold. One was that the message I was getting from the many people who email me is that while they found the information on the site extremely valuable, they didn't have time to read it all online. They often write to ask me questions that are answered on the site, so it was becoming clear to me that the sheer size of the site was making it harder to find important relevant information stored on it. The other reason for putting this information into book form is that the linear structure of a book makes it possible to control the sequence in which readers encounter information. This makes it possible to explain things in a way where one idea builds on the previous one. Because you can't control the order in which visitors encounter information on a Web site, you often can't rely on their having the concepts needed to grasp the importance of a particular fact. The information on the Bloodsugar101.com site assumes a certain level of understanding about our bodies and our health that many people, even educated people, do not have. The book form is perfect for addressing this problem. What I am loving about this book is the way that it takes readers step by step through the concepts they need to understand to control their blood sugar and prevent complications. The process of writing it has been valuable for me, too. I've had to to go back and revisit the content of the site, check my references, and sharpen my own understanding of the information presented there. The site has certainly grown beyond my ability to keep it all in my head! This isn't my first venture into publishing. As some of you know, I'm the author of seven published business books including one that was a bestseller for John Wiley & Sons. After the success of the bestseller, I started my own small press and sold almost 20,000 books on my own. Unlike most self-published books, my books made it to the shelves in Borders, Barnes & Noble and other chains. I learned a great deal about publishing with those books, and I'm hoping to put that knowledge to use with this one. 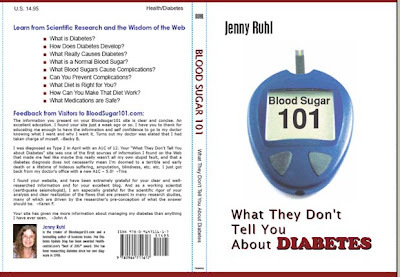 The Blood Sugar 101 book will be available through Amazon and the other online bookstores. I'll also be offering it through the Bloodsugar101.com web site where you will be able to buy it using PayPal. I'm going to be running a pre-publication offer where book rate shipping to addresses in the United States will be free. More about that when I get the web site set up to handle it.